One of my favorite souvenirs to bring back from vacation is the sand from our beach vacations. I never realized how different sand is from each other until I started collecting and saw them side by side. I collected a lot of sand over the years and was even given sand by my daughter, Lisa, when she went to California. 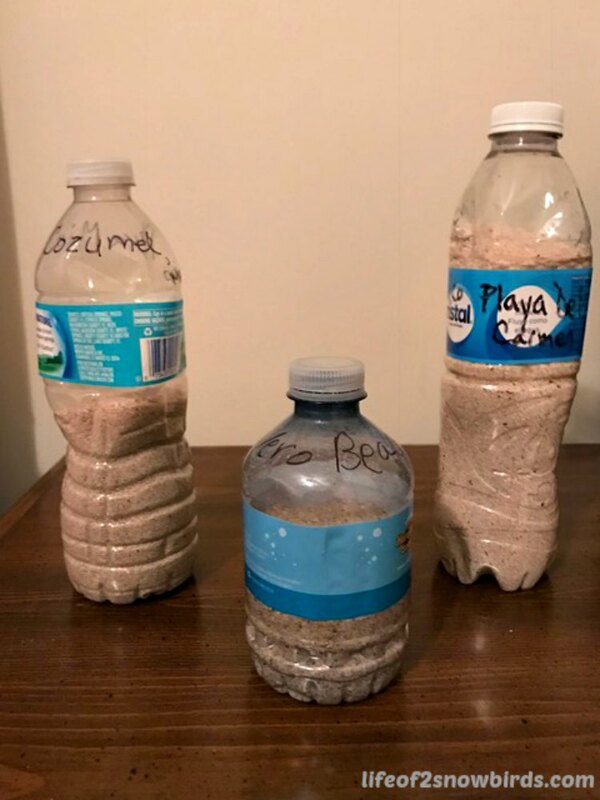 What I did when I finally decided to do something with the collected sand, was to put them in separate glass bottles. I soon had too many bottles and nowhere to display them. My second idea was to turn them into ornaments for our Christmas tree. I bought small baby rattles at A.C. Moore that could be filled with candy for a baby shower. I labeled them and then filled them with the sand. The ornaments were too heavy for the branches of the tree and didn't look right. My third try at displaying the sand is finally something I am happy with. I like how the sand art turned out so much that I am starting to collect more sand to make another one. I always have a bottle of water with me when I go to the beach. I've found that the easiest way for me to bring sand home is in that water bottle. After I drink the water I dry the bottle out as best as I can. I try to put only clean sand in the bottle. I scoop up a handful of sand and just sift through it to get dried seaweed and anything else out that I don't want in the sand. When I'm happy with how the sand looks, I pour it into the bottle. 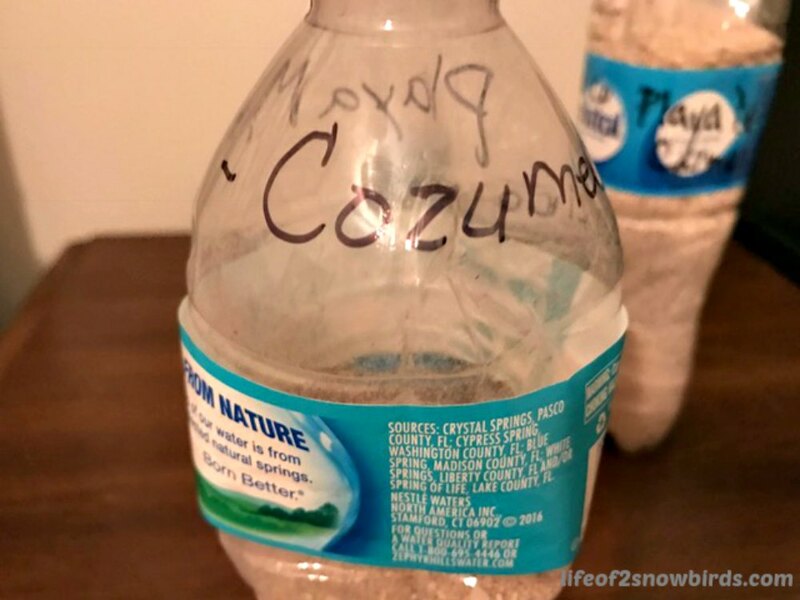 If you want to remember where your sand came from make sure you label your bottle or container. I keep a list of the beaches where the sand in my bottle came from. Starting from the bottom: Labadee, Haiti; 7 Mile Beach, Grand Cayman; Rehoboth Beach, Delaware; Horseshoe Bay Beach, Bermuda; Cape Cod, Massachusetts; Outer Banks, Maryland; Ochos Rio, Jamaica; Santa Monica, California; Cozumel, Mexico; La Jolla, San Diego; Carolina Beach, North Carolina; Long Beach Island, New Jersey. 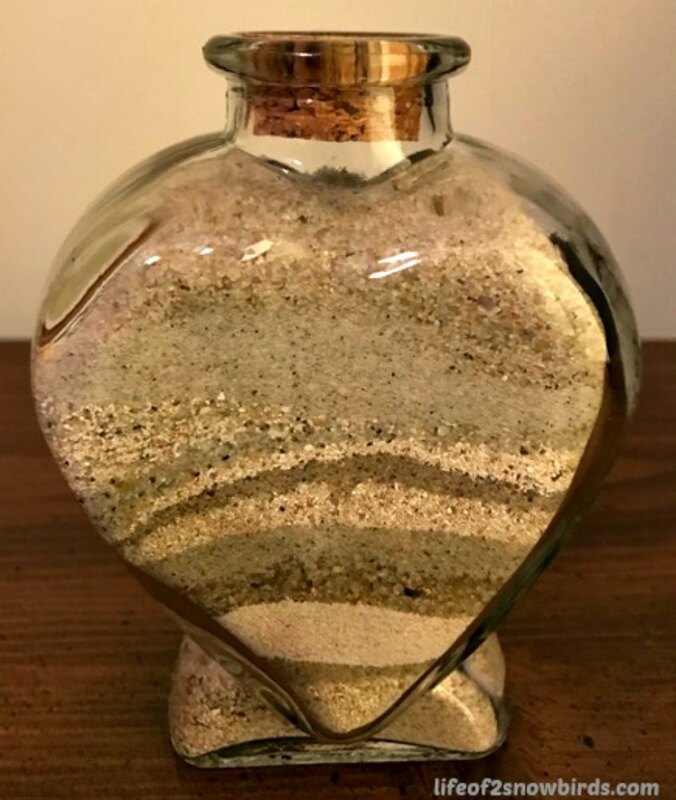 Before I started pouring the sand into the cute heart bottle someone gave me, I lined up my containers of sand to compare the color and texture. The more contrast in the color or texture, when you are layering, the better your sand art will look. I used a funnel to slowly direct the sand into the bottle. Be careful handling the bottle when it is not completely filled. Unfortunately, my bottle was not filled by the time we had to move from New York to North Carolina. I tried to hold onto it as best as I could but the sand shifted around towards the top and the sand from Mexico and San Diego blended together. I am excited about making my next bottle but I need a lot more sand. Guess I will have to go on more beach vacations! That is very creative to make sand art from the sand! what a way to preserve memories. It is amazing how sand can vary around the world! I love what you have done here - what a beautiful way to decorate your home, and remember your holidays! Thank you so much for sharing, and for being a part of The Hearth and Soul Link Party, Cathy. Hope you are having a lovely week. Yes it's amazing. It's funny how it could just look like plain old sand but when you compare it side by side with other sand the difference is incredible. Thank you as always for your nice comments, April! What a fabulous idea! We often bring home shells and I do store them in little decorative jars and I love the idea of having a layered sand jar with them. I would love to see what you did with your shells. Have you ever posted about them? It is a nice way to create a keepsake for your memories! Thank you for your thoughts! What a great way to create memories. I love the sand in the bottle idea. Thanks for sharing on Sunday's Best. Thanks Rhonda! It was fun to create! What a great idea. I wish that I had collected sand from all of the beaches that I have been to, but hey there is no time like the present to begin - Right!?! Thank you for sharing at Over the Moon. I'm sure you will be able to make one of these one day. Only takes a handful of beaches. Don't forget to bring your empty water bottle! I have some collections like this too, and I love the idea of making sand art! Thanks for sharing at To Grandma's House We Go! I would love to see your collections. 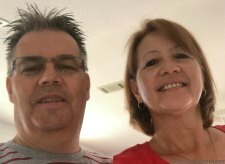 Did you blog about them? Thank you, Marilyn, and for hosting this wonderful party! Congratulations on the feature at Thursday Favorite Things. I absolutely love this idea! I'm going to start next month with some of that White Sand from the gulf of Mexico! Yay! So happy to hear that you will be making a keepsake for yourself! Very creative idea. It's pretty and as long as you're at the beach, you may as well bring some of it back with you. Love the idea. Yes! Hope you will be starting your collection soon!! I hope she will make one for herself! 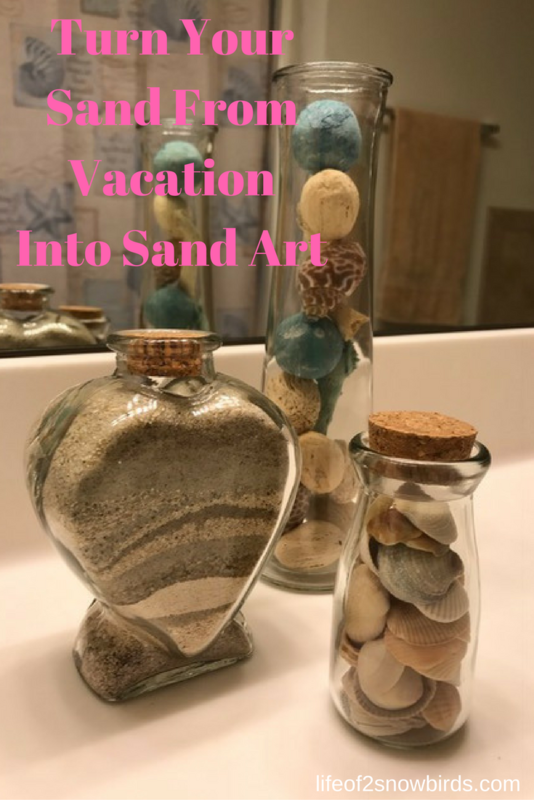 I remember doing it also and this vacation sand bottle was just as much fun to make. I can't wait to collect enough sand to make another one! Yes I love beachy too and it's fun when the decoration also has memories attached to it! What a great idea. I have never thought of saving sand though I do collect sea shells, I have a couple of big jars full of shells. I've only collected small shells, but I saw something really fun that someone did with their collection so I will be hunting for some now!